Balcom-Miller allowed 2 earned runs on 7 hits in 6.0 innings pitched, striking out 4 and walking 1 while hitting a pair of batters. He threw 85 pitches, 53 for strikes, and faced a season-high 26 batters. Despite the impressive line, Balcom-Miller indicated that it was not his best night. Balcom-Miller’s fastball sat at 90-91 mph for the first five innings, and as the evening progressed, he mixed in more off-speed pitches, throwing a low-80’s changeup and a slider in the mid-to-low 80’s. All four of his strikeouts came on breaking balls. Balcom-Miller, who had never earned an in-season promotion, said he did not know what to expect upon being called up, but would not admit to nerves. If he did feel nerves, New Britain did not take long to force him to buckle down. Balcom-Miller allowed his first Double-A hit to the leadoff batter, Steve Singleton, who worked the count full before hitting a slow roller to second baseman Oscar Tejeda’s left that he was unable to scoop cleanly. Singleton scored on a two-out Evan Bigley double that went over the head of Chih-Hsien Chiang in left field, the hardest hit ball Balcom-Miller would concede all night. Balcom-Miller picked up his first strikeout on a changeup to open the second inning, and after leading off the third with another strikeout, pitched around a single and a hit batsman to get out of the inning with no damage. He induced his second inning-ending double play of the evening in the fourth inning, this one a line drive behind the runner at first that led Jorge Padron right to the bag for an easy unassisted double play. Balcom-Miller’s third strikeout of the day came on an 82-mph slider that caught Daniel Rohlfing looking, and after plunking his second batter of the game, the right-hander got centerfielder Joe Benson way out in front of a changeup for his second strikeout of the fifth inning. But Balcom-Miller ran into trouble in the sixth, as his velocity and control waned. He issued his first walk and yielded another run, this one on a ground ball under Tejeda’s glove. Many of the aspects of his game that carried Balcom-Miller to success in A-ball carried over Tuesday. The 22-year-old kept everything down in the zone, and when he missed, he missed low. Control became an issue late in the game, as two of Balcom-Miller’s four three-ball counts came in the sixth. He was also punished when he got behind batters. Balcom-Miller went to a two-ball count seven times in the game, and four resulted in hits. “He had a couple 2-0, 3-1 counts that could have been avoided with first-pitch strikes,” Federowicz said. But overall, the Portland coaching staff was impressed with his first performance. “He did everything you need to do to be a successful pitcher at this level,” Portland pitching coach Bob Kipper said. 5/31 Cup of Coffee: It was a rough Memorial Day Monday for the affiliates, as they won only one of five games on the schedule. Pawtucket lost a 13-inning marathon to Norfolk (BAL), 5-4. The PawSox tied the game in the bottom of the 9th, but Clevelan Santeliz gave up the winning home run in the top of the 13th. Lars Anderson went 3-6 with a triple, 2 RBI and a walk. Matt Sheely went 2-5 with an RBI and a walk, while Hector Luna went 2-6 with an RBI and a walk. Felix Doubront started for Pawtucket and went 3.1 scoreless innings. He allowed 1 hit, walked 2 and struck out 5. After Tony Pena was roughed up for 8 hits and 4 runs in 3.1 innings of work, Tommy Hottovy and Blake Maxwell kept the game in reach, by combining for 5.1 perfect innings in relief. Hottovy went 2 innings and struck out 2, while Maxwell recorded 2 strikeouts in 3.1 innings. Portland jumped out to an early lead before losing to Trenton (NYY), 6-4. Ryan Lavarnway went 1-3 with a home run, 2 RBI and a walk. Lavarnway is hitting .387 over his last 9 games with 4 home runs and 8 RBI. His 11 home runs ranks 2nd in the Eastern League (to Cody Overbeck of the Reading Phillies, who has 13). Tim Federowicz delivered a 3-4 performance with an RBI. Alex Wilson got the nod for the Sea Dogs and battled through 5 tough innings. He gave up 8 hits, but only allowed 2 runs. Wilson walked 1 and struck out 2. Salem got the affiliates on the board yesterday with a 7-6 victory over Lynchburg (ATL). This was a wild one that featured 7 total runs in the 9th inning. Lynchburg scored 3 runs in the top of the inning to take a commanding 6-3 lead. Salem responded by scoring 4 in the bottom of the inning, highlighted by Dan Butler's walk-off grand slam. Butler went 3-4 with 2 home runs and 7 RBI. For those of you scoring at home, Butler drove in every single one of Salem's 7 runs. He even recorded a stolen base for good measure. Other strong performances at the plate for the Salem Sox included Reynaldo Rodriguez (1-2, 2 runs, 2 stolen bases and 3 walks) and Kolbrin Vitek (1-3, 2 runs and 2 walks). Drake Britton started for Salem and continued to struggle this season. Britton went 4.2 innings and gave up 4 hits and 3 runs. He walked 5 and recorded only 1 strikeout. For as good as he was last year, this season is not the best that Drake has ever had. Tom Ebert threw 3.1 scoreless innings in relief of Britton. He allowed 2 hits, walked 1 and struck out 3. Greenville gave up a sizable late lead, as they lost to Asheville (COL), 9-7. The team was up 5-1 entering the 8th, but promptly gave up an 8 spot in the top of the inning. Christian Vazquez went 2-5 with 3 RBI. Drew Hedman went 2-4 with 2 RBI and a walk. Felix Sanchez went 3-4 with 3 runs, a stolen base and a walk. Kyle Stroup drew the start for the Drive. He went 4 innings and allowed 3 hits and 1 run. He walked 3 and struck out 5. Chris Martin began his relief appearance with 3 scoreless innings, but allowed 2 earned runs in the top of the 8th. Juan Rodriguez came on in relief and gave up 5 hits and 6 runs, while only recording 1 out. It's safe to say Rodriguez wishes he had a do over on this outing. The DSL Red Sox suffered their first loss of the young season, a 4-1 defeat at the hands of the DSL Dodgers. The Sox managed only 3 hits in this one, all singles. The lone hits were collected by Alixon Suarez (1-3), Deiner Lopez (1-2) and Roberto Duncan (1-1, walk). Pedro Reyes started and threw 4 scoreless innings. He allowed just 1 hit, did not walk a batter and struck out 2. Player of the Day: Dan Butler. Butler went 3-4 with 2 home runs and 7 RBI, including a walk-off grand slam, in Salem's victory over Lynchburg. It’s that time of year again, as the MLB First-Year Player Draft gets underway in less than a week, on the evening of Monday, June 6. The first round will kick off at 7:00 pm ET from Studio 42 at MLB Network in Secaucus, N.J., broadcast live on the MLB Network and MLB.com. Day One will include the first round and the supplemental compensation round, with the time between picks set to five minutes for the first round and one minute for the supplemental round. Day Two will start at noon on June 7, covering rounds 2 through 30, and Day Three will kick off at noon on June 8, covering rounds 31 through 50. Days Two and Three will be exclusively covered on MLB.com. From Boston’s perspective, this will be the second draft with Director of Amateur Scouting Amiel Sawdaye at the helm. By almost all accounts, Sawdaye came away with an outstanding draft haul in his first year in 2010, but for obvious reasons the final results have yet to play out. He'll have plenty of ammunition to go after more top talent this draft -- which is regarded as a very deep one -- as the Red Sox have five selections in the first 100 picks, plus the number 19 pick overall. Here on SoxProspects.com, we'll bring you pre-draft coverage all week leading up to June 6, this being the first of a seven-installment draft preview. You can also follow Days One, Two, and Three of the draft here, as we’ll have live coverage of Boston’s selections on SoxProspects News, the Draft History page, and the SoxProspects Staff Twitter Feed. For now, here's some general information to whet your palette. Greenville public relations director Eric Jarinko announced Sunday night on Twitter that pitcher Anthony Ranaudo has been promoted to High-A Salem. In 10 starts for the Drive, the right-hander out of LSU went 4-1 with a 3.33 ERA, yielding 35 hits and fanning 50 batters in 46.0 innings of work. He held opponents to 3 runs or less in all but two of his starts, and set the wheels in motion for his promotion by striking out 8 in 6.0 innings of 3-hit ball Saturday night against Kannapolis. Ranaudo was selected 39th overall by Boston in the 2010 draft. Ranaudo will assume the rotation spot of Chris Balcom-Miller, who according to Salem broadcaster Evan Lepler, earned a promotion to Double-A Portland this weekend after a brief stay in Salem. 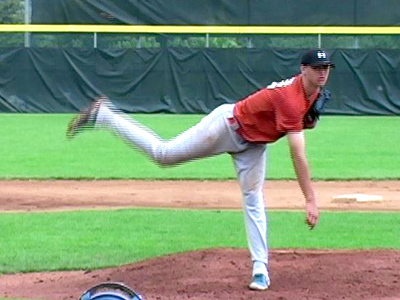 Balcom-Miller dominated the Carolina League, posting a 2.34 ERA in 34.2 innings of work. Acquired from Colorado in August 2010 in a trade for Manny DelCarmen, Balcom-Miller went 3-1 in 7 starts for Salem, striking out 37 and walking 11 batters while conceding just 24 hits. Take: Mostly relying on his 91-93 MPH fastball, Miller effectively kept his heater down in the zone during the outing and limited the amount of solid contact against by moving the pitch around both sides of the plate. Throwing from about a mid ¾ arm slot, his fastball showed good life early in the performance, touching 95 twice in his first inning. He was able to maintain solid velocity deep into the game demonstrated when he reached back in his seventh inning of work to touch 94 MPH on a swinging strikeout. Miller’s fastball showed some late finish, but was mostly on the straight side. Batters were having a difficult time squaring it up due to him working consistently on the corners and out of the middle of the plate. When Miller missed with his fastball, he typically missed lower in the zone and off either side of the plate. He has a tendency to hang onto the ball too long and release it late in his delivery, which was the reason for instances of losing control of his fastball in spells during the outing. Much of Miller’s command issues stem from trouble repeating his delivery and finding a consistent arm slot. It appears that he has settled in on throwing from a mid ¾ arm slot and looked more comfortable repeating it, but still fights himself some during his delivery. When Miller threw his 81-83 MPH changeup in the outing, he came from a higher arm angle and his mechanics throwing the offering were distinctly different than when he throws the fastball and slider. Despite showing some fade away from right-handed batters the deception with the pitch was inconsistent and hitters picked it up more quickly to take for balls. Miller also features a 77-81 MPH slider that showed good break down across the strike zone and into the dirt. He didn’t use either of his secondary offerings all that much, but his slider was the most effective when he established his fastball early in the count. Throwing 55 heaters out of 80 overall pitches, it was clear that Miller was working on becoming more consistent with his release point and repeating his optimal delivery. A building block outing, he still has work to do becoming more fluid and less jerky with his delivery, but Sunday’s performance was a step in the right direction. Take: Recently promoted to Triple-A, Lin looked comfortable at the plate in the game and produced three instances of very solid contact. The best charge he put into the ball actually resulted in an out as he picked on a first pitch fastball during his second at-bat to rifle a liner right at the third baseman. Aggressive in his first three at-bats, Lin did a nice job going with a 1-0 fastball leading off the game to sting a line drive into right field for a single and then promptly stole second base by getting an excellent jump off the pitcher. He worked himself into a 3-1 count during his third at-bat before getting an inside fastball and quickly clearing the ball out to drive it to the warning track in left field for a double. Lin did look like he was cheating a bit and clearing his hips out early, but did a nice job getting the head of the bat out in front of the baseball to drive it well. His last two at-bats resulted in weak contact as he fisted a popup to the second baseman and yanked a changeup away to the third baseman for a slow roller. A solid defensive player, Lin got excellent reads on the balls hit in his direction, including ranging deep on a ball hit over his head to reel it in with ease. He also made two nice plays coming in on soft liners to grab them before they dropped in for hits. Lin’s defensive game is trending towards becoming potentially elite at the major league level as he continues to slow things down and limit some of his instances of rushing throws needlessly. The majority of Lin’s work in Triple-A centers on creating better contact and cleaning up his swing mechanics to help him drive the ball more frequently. When making weak contact, he gets himself too far out in front of the ball and the head of the bat drags, causing him to chop, push, or roll-over pitches. In this game, Lin did a much better job of staying back and using his hands, which resulted in three instances of very solid contact for him and the ball coming off his bat well. 5/30 Cup of Coffee: The affiliates took 3 of 5 games on Sunday, which included 2 stellar pitching performances. Pawtucket had little trouble taking care of Indianapolis (PIT), 9-2. Ronald Bermudez went 3-4 with a home run (his first of the season) and 4 RBI. Tony Thomas went 2-4 with a double and a solo home run. Also contributing for the PawSox were Brent Dlugach (1-3, solo home run) and Che-Hsuan Lin (2-5, 2 runs and a double). Lin, who was recently promoted from Portland, has been impressive for Pawtucket thus far. The outfielder is hitting .355 over his first 8 games in AAA. Andrew Miller picked up the win for Pawtucket as he threw his best game of the season. Miller “started” the game after Bobby Jenks pitched the first inning as a rehab appearance (1 hit, 1 run, 1 walk and 1 strikeout) and contributed 7 great innings. He surrendered just 1 hit, no runs, walked 2 and struck out 4. Portland had an early lead before surrendering that lead late in the game as they lost to Trenton (NYY), 5-2. Chih-Hsien Chiang went 1-3 with a solo home run. Chiang has had a good season thus far, and has been particularly good over his last 8 games. The 23-year old outfielder has hit .407 with 3 home runs and 11 RBI in that time. Jon Hee went 2-3 with a double and an RBI. Michael Lee got the start for Portland. He went 6.2 innings, allowed 3 hits and no runs. He walked 2 and struck out 4. Cesar Cabral entered in relief of Lee and got lit up to the tune of 6 hits and 5 runs in 1.1 innings. He walked 1 and struck out 3. Salem lost a squeaker to Frederick (BAL), 4-3. Shannon Wilkerson went 2-4 and hit a solo home run for the 3rd straight game. David Mailman went 1-4 with an RBI. Dan Butler went 2-4 with a run. Chris Hernandez started for the Salem Sox and for the first time in several starts, he struggled. He allowed 5 hits and 3 runs over 4.2 innings. Hernandez walked 4 and struck out 1. The outing drops Hernandez' record to 5-2 on the season. Greenville got great pitching en route to a 4-1 victory over Asheville (COL). Heiker Meneses went 2-3 with a walk, a triple and 2 RBI. Felix Sanchez and Lucas LeBlanc each went 2-4 with an RBI in the victory. Brandon Workman started for the Drive and picked up his first professional victory. Workman threw 6 innings and allowed just 6 hits and a run. He did not walk a batter and struck out 7. After a rough start to his season, Workman has turned things around. Over his last 3 starts, he has allowed just 1 earned run and has an 18:2 K:BB ratio. The DSL Red Sox routed the opposition for the second time in as many games, as they beat the DSL Royals, 8-2. Aneudis Peralta went 2-4 with a double and 2 RBI. Robert Del Rosario and David Sopilka each went 1-4 with 2 RBI, while Jair Bogaerts went 2-3 with a triple and an RBI. Sully Bonnelly started for the DSL Sox. He went 4 innings and allowed 5 hits and 2 runs (1 earned). He did not walk a batter and struck out 3. Oscar Melendez picked up the victory in relief. He pitched 4 shutout innings and allowed 4 hits. He did not walk a batter and struck out 1. Player of the Day: Andrew Miller, who threw 7 shutout innings and allowed just 1 hit in Pawtucket's victory. 5/29 Cup of Coffee: The Dominican Summer League got underway on Saturday on a day which yielded mixed results for Red Sox affiliates. Pawtucket took a 7-0 lead into the third inning, but the Indianapolis Indians (PIT) rallied back to take down the PawSox 9-7. Home runs from Hector Luna, Michael McKenry, and Brent Dlugach in the first two innings helped stake Pawtucket to a seven-run lead, but those would be all the runs the PawSox would push across. Kyle Weiland pitched 5.0 innings, allowing 2 runs on 5 hits while walking a pair and striking out 8. Jason Rice yielded a pair of runs in his 2.0 innings of work, while Clevelan Santeliz was charged with the blown save and the loss after throwing the final 2.0 innings and giving up 5 runs (3 earned). Both Luna and Dlugach tallies a pair of RBIs in the loss. Portland was scheduled for a doubleheader against the Trenton Thunder (NYY) and dropped game one of the twin billing by a score of 8-7. Stephen Fife started for the Sea Dogs and was knocked around, allowing 6 runs on 11 hits in 4.2 innings of work. He also both walked and struck out 3 batters. Like the PawSox, Portland got out to an early lead thanks to the long ball. Ryan Lavarnway launched a three-run homer to left in the bottom of the first to give the Sea Dogs a 3-0 lead. After two Trenton runs, Chih-Hsien Chiang added a two-run home run of his own to extend the Sea Dogs lead to 5-2. Trenton scored two more in the fourth, and then scored four more times off a combination of Fife and Seth Garrison. Lavranway hit his second home run of the game in the fifth, but it was not enough to complete the Sea Dogs comeback. Portland scored seven runs again in game two, and this time it was enough to earn the victory and the split of the doubleheader with a 7-5 triumph. Portland scored all of their runs in the second inning due in part to two hits in the inning from Will Middlebrooks, a solo home run and a two-RBI double. Jonathan Hee added three RBI with a double while Chiang continued to contribute with an RBI of his own. Jeremy Kehrt started but couldn't make it out of the fourth, firing 3.2 innings and allowing 4 runs (2 earned) on 5 hits while walking 2. Eamonn Portice came on and finished the game to earn the win allowing just 1 run on 2 hits over the final 3.1 innings. After dropping both ends of a doubleheader to Frederick (BAL) on Friday, Salem continued to struggle after getting doubled up by the Keys 6-3. Ryan Pressly got the start for Salem and went 4.2 innings and allowed 5 runs on 5 hits with 3 walks and 2 strikeouts. Down 1-0 in the bottom of the first, Shannon Wilkerson went deep to tie the score on his fifth home run of the year. The Keys scored a pair of runs in both the third and fifth innings while also plating a run against William Latimer in the seventh. Salem looked to claw back in the bottom of the seventh on a solo home run from Reynaldo Rodriguez. Michael Almanzar added a sacrifice fly, but the deficit was too much to over come and Frederick took its third straight from the Salem Sox. Anthony Ranaudo moved his record up to 4-1 after Greenville's 5-2 defeat of the Kannapolis Intimidators (CWS). Ranaudo went 6.0 innings and gave up 2 runs on 3 hits while fanning 8 without walking a batter. A steal of third by Sean Coyle led to the Drive's first run after the throw went into left field and Coyle scored. Greenville padded its lead in the third on RBIs from Felix Sanchez and Christian Vazquez. A fourth-inning home run from Henry Ramos-- his first with the Drive-- gave Greenville a 4-0 lead. The Intimidators cut the lead in half with a pair of runs in the fifth, but an insurance run in the seventh came in the person of Sanchez, who knocked in another run with a single. Keith Couch threw a perfect seventh, eighth, and ninth to earn the three-inning save. The Dominican Summer League opened its schedule yesterday, and the DSL Red Sox came out in grand fashion with an 11-2 trouncing of the DSL Yankees2 (NYY). The Yankees actually opened up the scoring in the fourth with two runs, but the Red Sox scored 11 unanswered runs for the victory. Ynoel Aguero went 3 for 4 with 3 RBI while Aneudis Peralta added a pair runs batted in with a 2-for-4 day at the plate. Francellis Montas started for the Red Sox and went just 2.0 innings, though he did not allow a hit and fanned four batters. Edwin Osorio, William Cuevas, and Ellis Jimenez all pitched in relief, with Osorio the only DSL Red Sox pitcher to allow any runs. Player of the Night: Ryan Lavanway, who combined for a 4-for-5 with 2 home runs and 4 RBI in a doubleheader against Trenton. He also drew a walk in each of the two games. 5/28 Cup of Coffee: Salem and Greenville both had extra chances to pick up a win Friday night, but only Greenville picked up a victory in their double-header. Big league reliever Bobby Jenks combined with Matt Fox and Hideki Okajima to keep the Indians at bay for the first eight innings, but Michael Bowden allowed a grand slam in a 5-run ninth to give Pawtucket a 6-3 loss to Indianapolis (PIT). Jenks tossed a scoreless first, allowing 1 hit before Fox struck out 6 in 6 innings of 5-hit, 1-run ball. Okajima tossed a perfect eighth before old friend Andy Marte went deep with the bases loaded in the top of the ninth to give the Indians the lead for good. Brent Dlugach and Jose Iglesias drove in runs in the second, and Iglesias singled to score Daniel Nava in the eighth. Nava was 2 for 4 with a pair of doubles and 2 runs scored, and Iglesias was 2 for 3. Hector Luna also had a pair of hits in the loss. Stolmy Pimentel's winless 2011 continued in Portland's fog-shortened 4-2 loss to Trenton (NYY). The righty went 5.0 innings, allowing 3 runs, 2 earned on 5 hits and a walk. He struck out 4 before Caleb Clay allowed a run in 2.0 innings of relief. Most of the Sea Dogs' production came from the bottom of the lineup, with Chih-Hsian Chiang, Jon Hee and Vladimir Frias picking up 2 hits apiece in the loss. Hee drove in both Portland runs with a 2-run single in the fourth. In the first game of Salem's double-header, Junichi Tazawa pitched into the fourth inning in his second rehab appearance since Tommy John, but was rocked to the tune of 8 runs on as many hits in 3.1 innings in a 10-3 loss to Frederick (BAL). Tazawa yielded three home runs in the cavernous Lewis-Gale Field before Dennis Neuman tossed 1.2 innings of scoreless relief and Jeremiah Bayer allowed 2 runs in a pair of relief innings. Dan Butler went 2 for 3 with a double and an RBI, while Reynaldo Rodriguez added a pair of hits and an RBI in the loss. In game two, Frederick pushed the winning run across in the top of the seventh off Anatanaer Batista to hand Salem a 4-3 loss. Pete Ruiz gave up 3 runs on 5 hits in 3.2 innings, and Batista tossed 3.1 innings of relief, with the winning run being the only blemish. Shannon Wilkerson was 2 for 3 with a solo home run, while Peter Hissey, Matt Spring, and Derrik Gibson all doubled in the loss. Greenville played two as well and saw much better results than Salem, slamming Kannapolis (CWS) 8-1 in game one. Miles Head hit a two-run in the Drive's six-run third, while Henry Ramos and David Renfroe each drove in a pair of runs on the game. Ramos and Brandon Jacobs doubled twice and Sean Coyle was 1 for 3 with a triple and a run scored. Miguel Celestino and Juan Rodriguez combined for a 7.0 innings of 2-hit, 1-run ball, with Celestino going the first 6.0 and Rodriguez throwing a perfect seventh. Kannapolis exacted revenge in game two, thumping the Drive 7-1. Scott Swinson picked up the loss despite striking out 5 and allowing a pair of runs on 3 hits in 5.0 innings, and Tyler Lockwood allowed 4 runs, 3 earned on 4 hits in 2.0 innings. Freddy Sanchez and Jose Garcia each had a pair of hits, and Head drove in the Drive's only run in the loss. Player of the Night: Miguel Celestino was a lone bright spot on the evening, allowing two hits in 5.0 innings of 1-run ball as the Drive picked up the lone win down on the farm. As part of SoxProspects.com's annual draft coverage, we will be featuring interviews with top local draft eligible prospects. Today's interview is the third in the series. Click here for my interview with UMass Lowell southpaw Jack Leathersich and here for Jon Meoli's interview with UConn's George Springer and Matt Barnes. Tyler Beede is a 6-4, 200 pound right-handed pitcher from Lawrence Academy. The son of former Chicago Cubs minor leaguer Walter Beede, Tyler has lived and breathed baseball his entire life. A rare polished product coming out of high school, Beede has a strong commitment to Vanderbilt University this upcoming fall. With an arsenal of pitches with plus potential and repeatable mechanics, Beede has gained attention as a top prospect in this year’s upcoming draft. He has been ranked the 30th best draft eligible prospect by Keith Law, 35th by Baseball America, and also appeared on MLB.com’s list of top 50 draft prospects. Last season as a junior, Beede went 6-1 with a 1.08 ERA, striking out 87 in 45.1 innings. Fresh off a no hitter on May 11th, Beede sat down with me to discuss his career, growth and future as a person and a pitcher. John Gray: Your father Walter was drafted in the 13th round by the Cubs in 1981. What effect did growing up around the game and having a father who played professionally have on you? How has the experience prepared you for your baseball career? Tyler Beede: Going through the process I am right now, his experience in professional baseball really helps. You know, knowing what he went through and what he would have done differently and what he learned is really insightful. He has been my biggest influence, my greatest teacher, my biggest fan, always talking to me about the game and introducing me to it at such a young age. He’s always pushed me to be the best I can be, and he teaches me new things every day. JG: You had a number of schools looking to recruit you, why did you eventually settle on Vanderbilt? TB: The academics really stood out to me, they are top 20 in the country. The baseball program speaks for itself, they get better each year and right now they are one of the best programs in the country. The coaching staff is tremendous and I really would love to play for Coach (Tim) Corbin, he’s a leader both on and off the field. DJ (Derek Johnson) the pitching coach has helped to produce first round pitching year-in and year-out. David Price, Sonny Gray, the list goes on for guys that have come out of the program and had tremendous success. I really could see myself there for four years. When I took my visit I felt right at home. JG: With your strong commitment to Vanderbilt, how do you view the upcoming MLB draft? Have there been any teams that have displayed significant interest? Boston? Are you dead set on going to college or would you be amenable to sign if the right situation presented itself with a pro team? TB: Just being a part of this very talented draft is a great honor. They are saying this one of the deepest drafts in quite a while. It would be a dream come true to hear my name called and play professional ball. For now, I am just enjoying the process and seeing what happens. When the decision comes, it will be one of the toughest decisions I think I’ll ever have to make. Boston has certainly shown a good deal of interest, being a team that’s in my backyard. I actually went to Fenway and talked with some guys and toured the stadium and the offices and it was a great experience for me. They’ve always been my favorite team and will continue to be going forward. JG: You have gotten to pitch in contests at Fenway Park, Yankee Stadium and Wrigley Field. For those of us who haven’t had that experience, tell us what it is like to take the mound in such hallowed grounds? Which venue was your favorite to pitch in? TB: It was such a great honor, one of the best moments of my life to take the mound in those great stadiums. Pitching in front of family and friends in Fenway was something I will never forget. Hopefully I can have the chance again as a professional. I was really nervous especially at Fenway. I remember I came in for the third or fourth inning and my entrance music, Thunderstruck by AC/DC, started playing and I just ran to the mound as fast as I could and my warm up pitches were just a blur. I was out of breath from running so fast and just couldn’t believe what I was going through. Once the inning got underway, I was absolutely fine though and I was able to focus in on the task at hand. JG: Please describe your pitching arsenal and how it has developed over time? Is there anything you are currently working on? TB: I throw a four-seam fastball that sits in the low-90s, I’ve been able to reach the mid-90s with it here and there. My changeup, which is a circle change, is probably my best pitch. It is my go-to pitch in almost any situation and I feel comfortable throwing it in any count. In the offseason, I worked on a 12-6 curveball as my coaches at both Lawrence and Vanderbilt wanted me to try and develop it a bit better. I had thrown it for a few years but it really wasn’t a strong pitch, now it has become one of my best pitches, sitting in the 70s with the hard 12-6 bite. JG: You were a standout pitcher at Auburn High before transferring to Lawrence Academy, what caused you to make the switch? TB: The academics and helping me to better prepare me for the next step. You know, I am doing my own laundry, living away from home and learning how to be independent. At prep school, you have to wake up early; you have a routine every day. I feel like I have matured and learned a lot in the past few years and certainly gotten better with my academics. I feel like whether I go to college or pro ball next year, I am ready for the challenge. JG: You recently finished off a no-hitter against Brooks School in front of numerous scouts. Take us through your mindset as the game progressed and what the feat meant to you. TB: You go into every game with the same mindset, throw strikes and compete within the strike zone. That day in pre-game warm-ups I really felt like I had all three pitches working. My catcher Kevin Wnukowski and I were on the same page, it was one of those days where you aren’t shaking him off too much and just really clicking on all levels. I was working quickly and getting outs, getting a lot of swings through my fastball and over my changeup, and my curveball was biting hard. My defense played well behind me and the offense put quite a few runs on the board to take any pressure off me. When your team puts up runs for you early you really don’t have that added pressure of protecting a run or two. JG: Has the increased amount of attention you have gotten from scouts affected your game at all? TB: I am used to it by now. When I was a sophomore, I went to a showcase in Jupiter, FL and I remember seeing a bunch of scouts for the first time and it was certainly a wow type of moment. Over the years, you just get used to seeing the guys back there with the radar guns and focusing on you but I just focus on the game and throwing strikes. JG: You have had great success at every stop in your career thus far, what contributes to your success? TB: Starting as a sophomore, I really wanted to separate myself and bring myself to an elite level. It took a lot of hard work during the offseasons. I went to a guy named Eric Cressey, who runs Cressey Performance up in Hudson, NH, and he helped put 40 pounds on me over the last 2-3 years, as well as 5-6 MPH on my fastball. I think the biggest area he helped me out in was keeping me healthy during the spring and winter circuits and helping me maintain my velocity all season long. There’s going to be times when you fail, but you have to just keep your body and mind sound and work hard every day and the success will come. JG: While I’m sure you have many, can you tell us what your favorite baseball memory would be and why? TB: Wow, that’s a good question. There are a lot of great moments, but my favorite would have to be winning the state championship at Auburn. It wasn’t about just winning a championship, it was a collective group of guys coming together and accomplishing something great. The year before we won, we had actually made it to the state championship and lost, so to make it back to the title game the following year and beat the same team we lost to was just a great experience. Being able to take part in games that competitive and have that type of a breakthrough with that team was something I’ll always remember for sure. Playing at Fenway is also at the top of the list. Growing up watching the Red Sox play every day, being a huge fan of the team and then being able to take the mound there is just beyond words. JG: Any superstitions? How do you prepare for a game day on the mound? TB: A lot of my superstitions are a week long thing. I do a lot of video breakdown of my performances; I watch video of when I was at my best and try to get that in my head so I can repeat it in games. I long toss, throw bullpens, and just prepare myself all week long. On game day, I will have an energy drink in the morning, an energy drink before the game, throw long toss and then a bullpen with my catcher, and then get right into the game. JG: You’ve also continued to play football even with your success on in baseball. What positions have you played on the gridiron and how much has your football career meant to you? TB: I’ve played football ever since I was 7 years old. We won a super bowl at Auburn, and the only year I haven’t played was my first year here at Lawrence since I wanted to get my feet wet academically as well as socially at a new school. I played again this year and was part of a very talented squad. I wanted to have that experience of playing football with my friends and just doing something else I enjoy. I’ve played a few different positions in football, mainly cornerback, wide receiver, and a little experience as a quarterback. JG: Do you have any major baseball influences or players you have looked up to other than your father? And how have they helped you progress as a player? TB: There are always those guys you watch that you want to emulate. For me, it was Josh Beckett. I tried to be exactly like him mechanically and for a while I was pretty close. Recently, I realized I am going to be my own guy and have taken on my own mechanics and personality. JG: If you could meet Beckett would you be nervous? If there was one thing you could ask them what would it be? TB: Oh there would be nerves for sure, but as a pitcher there are always things to talk about. I’d want to ask him how he prepares each week and how he battles hitters, how he handles his bullpens, etc. I’m sure if he was willing, that would be a conversation that would go hours and hours. JG: With such a focus on sports, is it hard to find time to be a regular high school student? TB: At times there are a lot of distractions at school, between high school drama and just the life of a high school student in general. The added pressures on me with the draft and keeping up with my academics are always present, but with having great teachers, coaches, and friends around me to keep me focused, I haven’t really had any issues keeping up with academics and being the best I can be both on the field and in the classroom. JG: I saw in another interview you enjoy rapping, any chance we see an album? TB: Haha. Yeah, I take it very seriously. There’s a lot of emotion in my rapping and it gives me a chance to talk about things I’ve done and decisions I’ve made through the art of music. I have really dedicated myself to it in my spare time. Whenever I have a minute, I’ll sit down and write whatever I’m thinking in my head. I’ve got a few songs set up for a mix tape. It’s something my friends love and I love, even if they get a laugh in every now and then. 5/27 Cup of Coffee: As the parent club in Boston continued to roll, the story on the farm was quite different. Pawtucket and Salem dropped close one run contests while Portland’s sloppy play torpedoed their chances. Greenville’s contest against Kannapolis was washed away by rain. Despite a strong showing from the bullpen, Pawtucket was nipped by the Indianapolis Indians (PIT) 4-3. Brandon Duckworth dropped to 4-3 as he tossed 4.0 innings, allowing 4 runs on 7 hits and 4 walks, striking out 2. Tony Pena relieved Duckworth and was outstanding, adding 3.0 innings, allowing just a hit and a walk while punching out 4. Clevlan Santeliz came on in the eighth and pitched a scoreless inning, allowing a hit but striking out the side. Tommy Hottovy also contributed a scoreless inning of relief, dropping his ERA to 1.42. Down 1-0 in the fourth, Tony Thomas lofted a sacrifice fly to tie the affair 1-1. The Indians responded by plating 3 in the top of the fifth, taking a 4-1 lead. In the bottom of the fifth, RBI groundouts by Jose Iglesias and Hector Luna brought the PawSox to within one. However, Pawtucket would only garner one base runner the rest of the way as their winning streak was snapped. Daniel Nava was 2 for 4 to lead the PawSox offense. Five errors and poor pitching lead to the Sea Dogs 13-7 defeat at the hands of the New Hampshire Fisher Cats (TOR). Miguel Gonzalez moved to 0-2 as a member of the Sea Dogs as he tossed 3.2 innings, allowing 5 runs (3 earned) on 4 hits and 4 walks, striking out 3. Kyle Fernandes added 3.1 innings of relief, allowing 4 runs on 6 hits, striking out 1. Santo Luis hurled the final 2.0 innings for Portland, allowing 4 runs on 6 hits and a walk, punching out 1. In the first, Jeremy Hazelbaker’s legs provided Portland with an early 1-0 lead. After leading off the inning with a walk, Hazelbaker stole second and moved to third on a throwing error, eventually scoring on a wild pitch. The lead was short lived however, as New Hampshire plated 2 in the top of the second and 3 in the top of the fourth to take a 5-1 lead. A Will Middlebrooks bases loaded walk and a Chih-Hsien Chiang sacrifice fly in the bottom of the fourth pulled the Sea Dogs to within 2 at 5-3. The Fisher Cats pounced back in the very next inning, receiving four runs to take a 9-3 advantage. In the eighth, a Ryan Lavarnway solo home run and a Chiang RBI groundout inched Portland closer, 9-5. The Fischer Cats once again responded in the top of the ninth with four more runs to open up a comfy 13-5 lead. Portland attempted to rally in the ninth, receiving RBI singles from Alex Hassan and Tim Federowicz, but ultimately fell short. Salem, looking to move into a first place tie, was the victim of some late game heroics as they fell 4-3 to the Myrtle Beach Pelicans (TEX). Chris Balcom-Miller hurled the first 4.2 innings, allowing 3 runs (2 earned) on 2 hits and 3 walks, striking out 7. Tom Ebert picked up the loss, hurling 3.0 innings, allowing 2 runs on 3 hits and 2 walks while striking out 3. Down 1-0 in the fifth, Salem tied the contest on a Mark Wagner RBI single. Myrtle Beach responded with 2 in the bottom half of the inning, but Salem tied the game again in the sixth on a Reynaldo Rodriguez RBI single that brought home 2. In the seventh, a Wilfred Pichardo RBI single gave Salem a 4-3 lead. In the eighth, Salem quickly loaded the bases with nobody out, but squandered the opportunity by getting no runs. Myrtle Beach took advantage of the missed chance by Salem, staging a two out rally in the bottom half of the inning to take a 5-4 lead. The Red Sox went down 1-2-3 in the bottom of the ninth to seal the defeat. Rodriguez and Wagner each had two hits to lead the Salem offense. Greenville’s contest with Kannapolis was postponed due to rain. The two teams will play a doubleheader starting at 5PM this evening. Player of the Night: Ryan Lavarnway, who went 2 for 5 with 2 runs scored, and a solo home run in Portland’s 13-7 loss to New Hampshire. Several media outlets have reported that outfielder Josh Reddick is in the lineup for Boston today, starting in right field and batting eighth. The 24-year-old outfielder posted a line of .248/.344/.527 with 12 home runs and 29 RBI in 44 games with Triple-A Pawtucket. More importantly for Reddick, for whom plate discipline has always been a concern, he has walked 26 times this season, matching his combined total from Boston and Pawtucket in 2010. Reddick will take the roster spot of Darnell McDonald, who went on the disabled list Thursday with a strained left quad. In other news, NESN's Heidi Watney reported that outfielder Daniel Nava, who was designated for assignment to make room for pitcher Franklin Morales, has cleared waivers and been outrighted to Pawtucket. As part of SoxProspects.com's annual draft coverage, we will be featuring interviews with top local draft eligible prospects. Today's interview is the second in the series. Click here for John Gray's Q&A with UMass-Lowell pitcher Jack Leathersich. Under head coach Jim Penders, the University of Connecticut baseball team has become something of a baseball factory in its tiny corner of the Nutmeg State. Among a loaded junior class for the Huskies, who enter this week’s Big East tournament as the conference’s top seed, are a pair of players expected to be taken in the first round of next month’s draft, outfielder George Springer (above left) and pitcher Matt Barnes. Springer, a junior from New Britain, Conn., emerged from the Cape Cod Baseball League last summer as arguably the top collegiate outfielder in the country and did nothing to shed that tag this season. He earned Big East Player of the Year honors, batting .379 with 12 home runs, 72 RBI and an OPS of 1.165. Barnes (left), a 6-foot-4 righty from Bethel, Conn., was the Big East Pitcher of the Year, going 11-3 with a 1.11 ERA in 14 starts. He struck out 97 in 105.0 innings of work. Matt and George took some time last month to talk about their season so far, the draft process, and who would win in a showdown between the two. Thanks to both players, as well as Kristen DeCarli of UConn’s athletic communications department, for being so accommodating on a day when the two stars were in high demand. Jon Meoli: It’s been a crazy year for you two in terms of attention and expectations. Can you talk about what the season has been like with all the pressure? Has it been difficult? George Springer: I don’t really think it’s been any different. Now there might be some increased pressure, but you really can’t think about it. With Matt, he’s going to go out and he’s going to throw, and I’m going to go out and I’m going to play hard. Matt Barnes: It’s a little different just being older, but other than that the expectations really aren’t there. It helps to have somebody like him, (shortstop) Nick (Ahmed) and a couple of other guys who are going to be high draft picks to talk about it as well. It kind of allows us to talk about it if we want, and if not, we don’t really think about it. We just go out, have a good time and play. JM: The team got off to a slow start, though you’ve picked it up of late. How do you balance the idea of team success when your own personal achievements have such a big influence on your futures? GS: As a player, the goal is to help the team. Ultimately, it’s about the team. For me personally, if I go 0-for-4 and we win, then I’m happy. That might not sound right, but I’d rather that and we win than for me to go 4-for-4 and we lose. MB: Baseball is kind of a funny sport like that, because it’s extremely individual but it’s still a team sport(?). If he goes 3-for-4 with 4 RBI or if I go out and throw a good game, there’s a direct correlation between us performing well and our team winning. I think you just can’t get caught up in the individual (aspects). If you come through in the moment and any of us performs in the spotlight, it’s ultimately helping the team, and that’s what matters. JM: Last year, (supplemental first round pick) Michael Olt was going through the same stuff with the scouts around and going through the draft process. Have you used any of what you saw with last season to prepare yourselves for the process? GS: That was something that, as his friend and teammate, I was happy for him. I can assume that all 35 guys last year were, and anyone who’s played with Mike. Just to watch the whole process for him, (13th round pick, second baseman) Pierre (LePage) and the other guys was awesome. MB: It was awesome. They’re great guys. It couldn’t have happened to better guys. Just watching how they went about it, how even though they were great players and a lot of people were talking about them playing the game, they really enjoyed being at the ballpark every day. They didn’t let the pressure of being prospects get to them. JM: Talk a little bit about the process of being scouted for the Major League draft. GS: For me, it might be a little different from him as a pitcher. From my experiences so far, it’s all been the same. But it’s really cool. You don’t normally have professional scouts for professional teams sitting in your living room, but there have been. There are guys here who should have that, and there are others that have, and if you ask them the same question, they’ll just tell you that it’s great. MB: I think they’re all pretty universal. They come in and tell you where the stadiums are, talk about the club a little bit and what they’re all about. Like he said, it’s a pretty cool experience, but they’re universal in the kinds of information that they cover. JM: George, you went through the same thing in high school, though it’s on a much larger scale now. Did you consider signing when the Twins drafted you out of high school? GS: I had my mind set on school, but as a kid and as a player, the goal is to ultimately play professional baseball. If it was something where I thought it was right and that it was something I should have done, I assume that I could have. But I’m happy with the decision I made now. JM: Now I assume you guys have been in contact with all thirty teams at this point. What’s it meeting with a team like the Red Sox who are drafting lower and might not have a realistic shot of being able to select you. Do they cover all their bases? MB: Anything can happen in a draft. You never know where a player is going to go, so yes, even teams that don’t pick that high are covering their bases. They still watch and still scout. JM: Now, you guys are both from around here. Who did you guys grow up rooting for? GS: I’m a Sox fan. MB: I’m a Yankees fan, but it doesn’t matter. Whoever gives you the opportunity, you take it. JM: Can you each give us a scouting report on yourself as a player? GS: I would say that I go out and play hard. Sometimes, I’ll get out ahead of myself, but I’ve got to slow it down. That’s the thing that I’ve been working on the last couple years, just slowing everything down. I’m a guy who’s going to go out, play hard, and have a lot of fun. MB: I just go out and try to get ahead of batters, throwing strikes and letting myself work. I let the defense play their games. I try to stay consistent from start to start and within a start. I like to get ahead of batters and see where the game takes me. Good things happen when you get ahead of batters. I throw a fastball, curveball, slider, and changeup. The fastball is probably 93-95, touching 97. The curve is high-70’s, slider low-to-mid 80’s and change-up low-to-mid 80’s as well. JM: George, if you had to stand in against Matt, what would your approach be? GS: I’m a little bit different. I know what he’s throwing [both laugh]. MB: Yeah, he’s been in center field for every one of my starts for three years. GS: I’ve been fortunate enough to play with him for the last four or five years. I know what he thinks, I know what he’s going to throw in certain situations, so it’s not fair at all. Sometimes, he’d get me. Sometimes, every once in a while, I’d hit one hard off him, but once I get in the box I know that he’d want to strike me out and I’m trying to hit a home run off him. MB: Whenever he gets in the box in practice and we’re going against each other, we make eye contact and just laugh. GS: I might utter something too, as a joke, but it’s all in fun. 5/26 Cup of Coffee: After the parent club put up 14 runs in a resounding victory Wednesday, Portland and Salem’s offense was minimal as they were clipped in close contests. Greenville, however, put up 11 runs in a win over Kannapolis. Despite some solid pitching, Portland was dropped by the rival New Hampshire Fisher Cats (TOR) 2-1. Alex Wilson was superb in his 6.0 innings of work, allowing an unearned run on 3 hits and 2 walks, striking out 6. Cesar Cabral picked up the loss, allowing the winning run on 3 hits and a walk in his 1.2 innings of relief. Seth Garrison tossed 1.1 scoreless innings of the bullpen, striking out 2. The Sea Dogs grabbed their lone run of the contest in the first on a Tim Federowicz RBI single. The Fisher Cats tied the contest in the fifth, aided by a costly error by shortstop Jon Hee. Portland never mounted a threat after the first, not advancing a runner past second for the remainder of the contest. Jeremy Hazelbaker was 2 for 3 atop the lineup to lead the Sea Dog offense. Trying to mount a late charge, the Salem Red Sox came up short in their attempt to take over first place, losing a close 3-2 contest to the Myrtle Beach Pelicans (TEX). Drake Britton dropped to 1-5 after allowing 2 runs on 2 hits and 2 walks while striking out 4 in his 4.0 innings. Mitch Herold followed Britton out of the bullpen, tossing 3.0 innings, allowing 1 run on 3 hits, striking out 1. Kendal Volz also added a perfect inning of relief, notching 1 punch out. Myrtle Beach took a 2-0 lead in the first, and held the Red Sox scoreless all the way until the seventh. Reynaldo Rodriguez cracked a solo home run to put Salem on the board and cut the Pelican’s lead in half. The Pelicans answered right back in the bottom half of the seventh, plating another run to once again carry a two run advantage. Kolbrin Vitek’s RBI single in the eighth brought the Red Sox within one once again, but the team left a runner at third in the ninth to dash their hopes of a comeback. Vitek was 2 for 4 to lead the Salem offense. The Drive’s powerful offense came on late to chase away the Kannapolis Intimidators (CHW) 11-7. Manuel Rivera received the start for Greenville, hurling 4.0 innings, allowing 4 runs (3 earned) on 5 hits and a walk, striking out 5. Chris Martin picked up his second victory in as many appearances for his 4.0 scoreless innings of relief, striking out 3 while allowing just a hit and a walk. Jordan Flasher added an inning of relief, getting roughed up for 3 runs on 3 hits while striking out 1. Down 3-0 after the top of the first, the Drive got one back in the bottom of the first on a Jose Garcia bases loaded walk. Sean Coyle’s RBI double in the second brought Greenville to within one at 3-2. The Drive were held at bay until the fifth, when Henry Ramos roped a two out RBI single to plate two runs and tie the game at 4-4. In the seventh, Jose Garcia hammered a two run home run to give Greenville a 6-4 advantage. The Drive would put the contest away in the eighth, as Coyle smacked a two run home run and Garcia added his second home run of the game, a three run shot that put Greenville in front 11-4. Kannapolis rallied in the ninth, scoring three but were ultimately unable to overcome the sizeable Drive lead. Miles Head returned from suspension with a three hit evening, raising his average to .408 in the month of May. Player of the Night: Jose Garcia, who went 2 for 4 with 2 runs scored, 2 home runs and 6 RBI in Greenville’s 11-7 victory over Kannapolis. This week's SoxProspects.com player and pitcher of the week polls featured clear-cut winners as Pawtucket's Lars Anderson and Greenville's Brandon Workman dominated the vote as well as the competition en route to winning their respective awards. Anderson, 23, was as consistent as his .429/.478/.714 line for the week suggests, collecting two hits in each of four out of six games played, but his week was highlighted by hitting home runs in both games of a double-header at Columbus (CLE) May 18. On the season, Anderson is hitting .288/.413/.392 with two home runs and ten doubles in 153 at-bats over 44 games. Workman, 22, threw ten shutout innings over two starts allowing seven hits and two walks while striking out nine opposing batters. Both starts came on the road at Augusta (SF), 4.0 innings, five hits, two walks four strikeouts, May 17; and Savannah (NYM), 6.0 innings, two hits, no walks and five strikeouts, May 22. In nine starts so far this season, Workman is 0-3 with a 3.96 ERA, having allowed 17 earned runs on 39 hits over 38.2 innings pitched, striking out 33 while walking only 9 and holding opposing batters to a .260 average. Workman is currently rated as the twenty-first ranked prospect in the organization by SoxProspects.com, Anderson is thirteenth.